Inauguration morning. 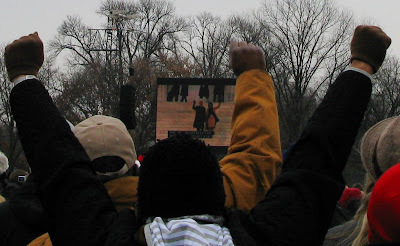 We saw on television that the Mall was already filling up at 6 am, so we decided to head to the Lincoln Memorial, where, according to the paper, there would be two Jumbotrons. It seemed like an appropriate place to watch the swearing-in. We caught a cab from the hotel to the Foggy Bottom metro station, which was as close as you could get by car, and then joined the crowds converging from every direction on foot. 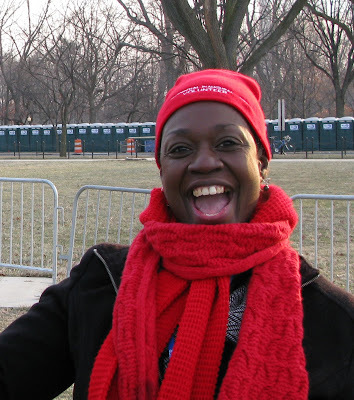 There were volunteers in red hats every hundred feet or so, directing the crowds and cheering us on like marathon runners in the home stretch. There were no Jumbotrons by the Lincoln Memorial after all, and the volunteers directed us up to the Washington Monument. 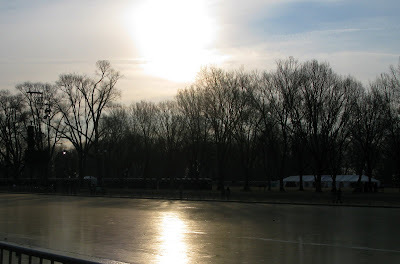 The reflecting pool was beautiful, and frozen solid. Definitely a sign of things to come. Here are some early arrivals by the Washington Monument. The Jumbotrons replayed concert performances from Sunday over and over again while we waited. If the idea was that the music would keep us warm, it didn't work. There is cold, and then there is bone-seeping, knife-cutting, flesh-killing COLD, and that's what we had through four hours of waiting and watching. This is so amazing being here. God, I'm cold. Two whole minutes since the last time I looked at my watch. God, I'm cold. Please, not Josh Groban AGAIN. God, I'm cold. This is what it looked like from inside the crowd. Since we were way back in the "cheap seats," no one felt the need for decorum. Bush and Cheney were heartily booed whenever their images appeared on the screens. 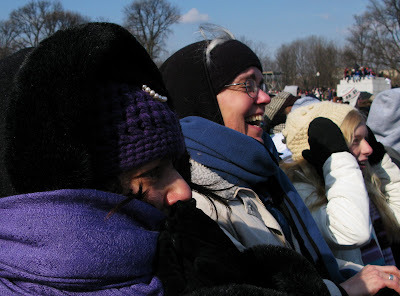 I took this picture as Obama took the oath of office. I thought I'd cry, like everyone else, but I just laughed and laughed. There was an African-American woman, about my age, maybe younger, standing next to me, and when it was over and everyone was cheering, she hugged me, and we just looked at each other and laughed, and hugged again. 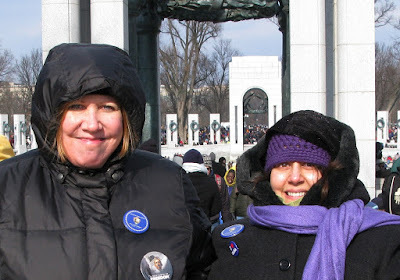 One of the volunteers kindly took this picture of us after the swearing in before we started the long walk out. There was a tent selling hot chocolate -- the "chocolate" part was a bit of an exaggeration, as it was watery and flavorless, but it was HOT, and at that point, that was all we cared about. We stopped for a minute, sipping, and suddenly a man ran by us, screaming "F*** you! F*** you!" It was startling, to put it mildly, given the general atmosphere of elated good will, but then we realized he was screaming at a helicopter flying low to the east, presumably the one carrying the worthless former President into ignominious retirement. We tipped our hot chocolate to the screamer, and continued the long march back to Foggy Bottom, and taxis, and the best hot shower ever. 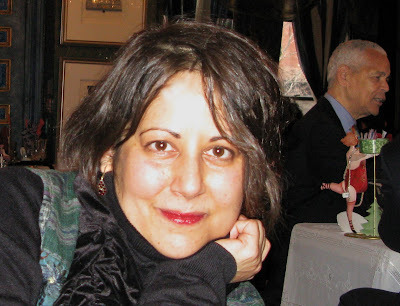 Here I am after the concert. More pictures tomorrow. Blogger doesn't seem to like more than two images per entry, so here are some more pictures. Sunday morning we had brunch at the Mansion on O Street. Julian Bond was at the next table. Then we walked down to the concert at the Lincoln Memorial. 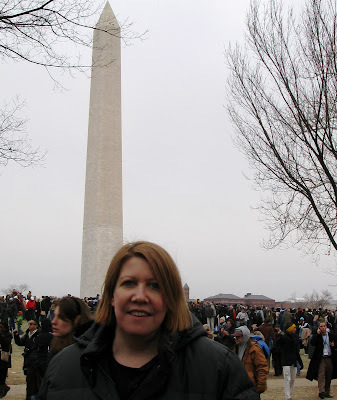 The crowds were huge but good natured, and by the time we got there we couldn't get any closer than the Washington Monument. So we watched everything on a Jumbotron, dancing in the crowd until the cold seeping up from the grass through the soles of our shoes forced us to get out of the crowd and sit down. We could actually hear better from the side -- instead of the half second delay as the sound hit each set of speakers by each Jumbotron, we only heard the music once. 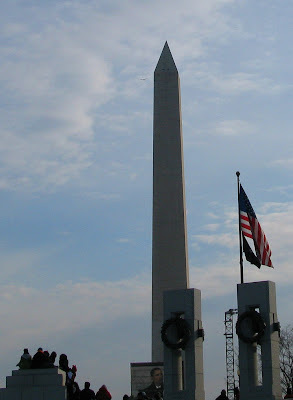 Here are some pictures from Washington. Most of my pictures turned out to be of crowds, because that's what we saw for the most part -- the backs and shoulders of our two million new friends. Everyone excited. Everyone happy. Bunting draped in front of bars and restaurants. Bunches of flags on every streetlight. 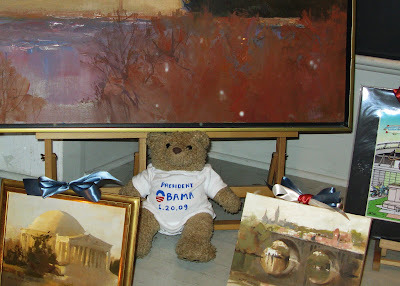 Obama in every shop window. 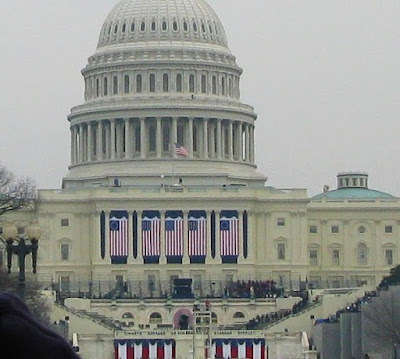 This is a picture from the Mall the day before the inauguration, while they were putting the final touches on the platform for the swearing-in.